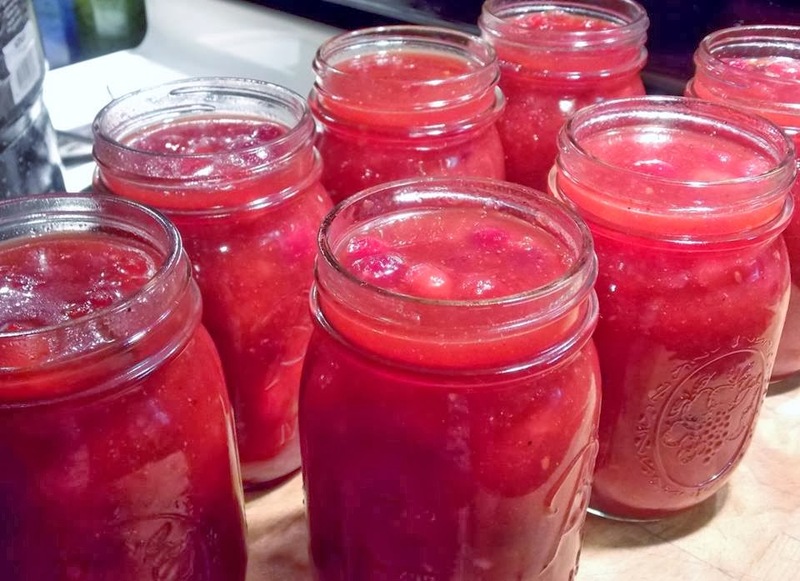 Sherrie's Cranberry BBQ Sauce - Canning Homemade! From Sherrie: I call this a Cranberry Barbeque Sauce. It's tangy, smokey, tart and sweet. I have always loved Cranberry Chicken, and this takes it over the top! You can enjoy this over baked chicken, turkey or ham. Use it as a dipping sauce too. Once you taste this flavor explosion, you will find a lot of uses for it. If you like sweet and sour sauce, you have got to give this a try. It's like winter and summer joining together in a jar. Thanks Sherrie for this really fantastic recipe and the great looking pictures to go with it! 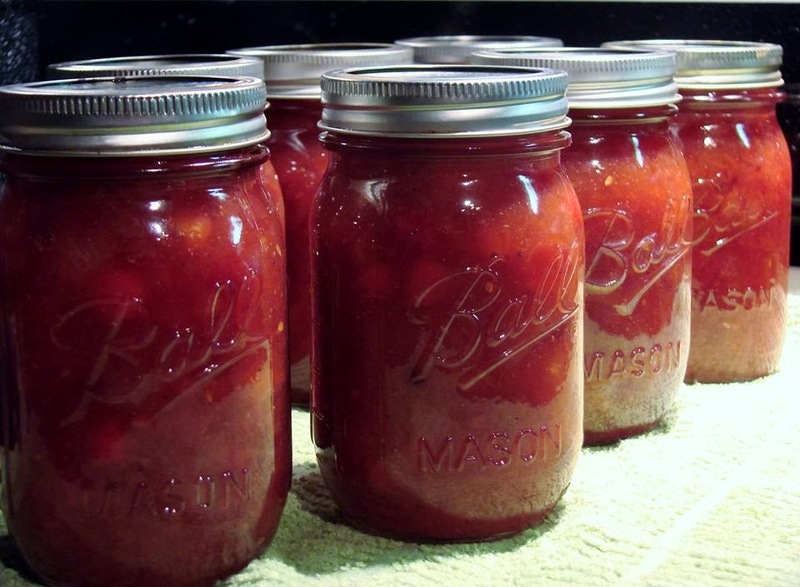 2 cups home canned tomato sauce, OR 1 qt drained whole tomatoes, pureed. Preparation : Prepare 7 pint jars, lids, and rings. Sterilize the jars and keep them in the hot water till it’s time for processing. Cooking: In a large stainless steel pot combine sugar and water. (if you are not using clear jel, use all 4 cups of sugar) Bring to a boil over high heat, stirring to dissolve sugar. Boil hard for 5 minutes and add cranberries. return to boil. Lower the heat and boil gently, stirring occasionally until the cranberries pop and liquid begins to slide off a metal spoon. This will take about 15 minutes. In a seperate pot, sautee the onions using 1 Tablespoon olive oil. Add tomato sauce or puree, brown sugar, orange juice, mustard powder, kosher salt, pepper, garlic powder, worcestershire sauce and vinegar. 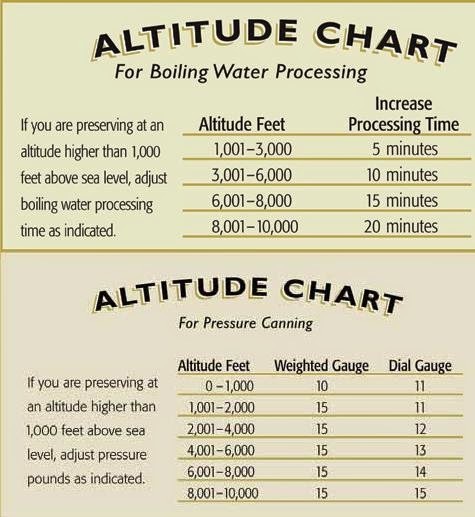 Simmer 3-5 minutes. If using the clear jel, mix 1/4 cup, with the reserved 1/4 cup of sugar that was set aside. Add the onion and tomato mixture to the pot of cranberries. Bring to a boil, add the clear jel and sugar mixture, stir until thickened, about 1 minute. Filling the jars: On a dishtowel place your hot jars and using your funnel in each jar using a ladle then fill the jars leaving 1/4" headspace. Remove air bubbles and refill to the proper headspace with the mixture if necessary. Taking a clean papertowel wet it with warm water and wipe the rims of the jars removing any food particles that would interfere with a good seal. Using your magic wand extract the lids from the hot water and place them on the now cleaned rims. Add your rings to the tops of each of the jars and turn to seal just "finger tight".